"Fun, quirky, suspenseful, and outrageous--this paranormal adventure will have you laughing, gasping, and turning the pages." The Tidwells are supposed to be on spring break on the Florida Gulf Coast, not up to their eyeballs in paranormal hijinks … again. Bertram wants a baby, but Cleo isn’t real keen on the idea. After all, her sister, Molly, has four of ‘em—who needs more? Hoping to throw Bertram off the baby trail, they adopt Luna, a white pit bull terrier, and take her to Florida with them, along with Bertram’s mother and Cleo’s nieces. 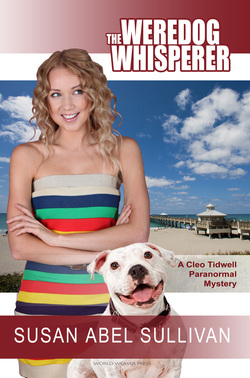 Everybody loves Luna, especially the goofy little dog at a tacky tourist trap touting something called a “weredog whisperer,” so much so that he puts the moves on Luna and gives her a love bite during the throes of puppy love.